Obsession alert! Warm, pull-apart buttermilk cloverleaf rolls have can’t-stop-eating-them flavor. With bread stuffing in the turkey, why bother to bake rolls? For me, there are two answers: gravy and butter. Meant to be served warm, soft American yeast rolls like these regularly appeared in the bread baskets of my childhood. Based on a 1950s recipe which I first developed about 20 years ago, I feel they have an heirloom quality and old-fashioned simplicity that feels right to me for Thanksgiving when we celebrate our American traditions. These rolls are part of mine. 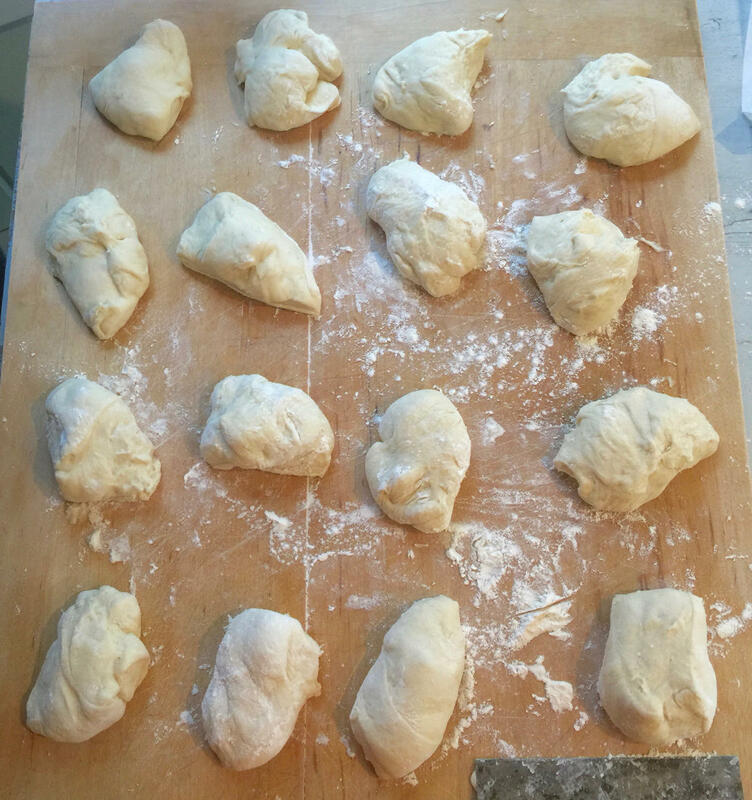 The dough is easy to make and handle, fun to shape (especially with little helpers) and the recipe makes 16 rolls, which bake in 15 minutes. It’s done in two steps: first a simple yeast starter is mixed and left to rise. Then the starter is added to the other 5 ingredients in the dough. I always use my food processor to knead bread dough because it’s fast and thorough — 2 minutes vs 15 minutes by hand to get a smooth, even texture. 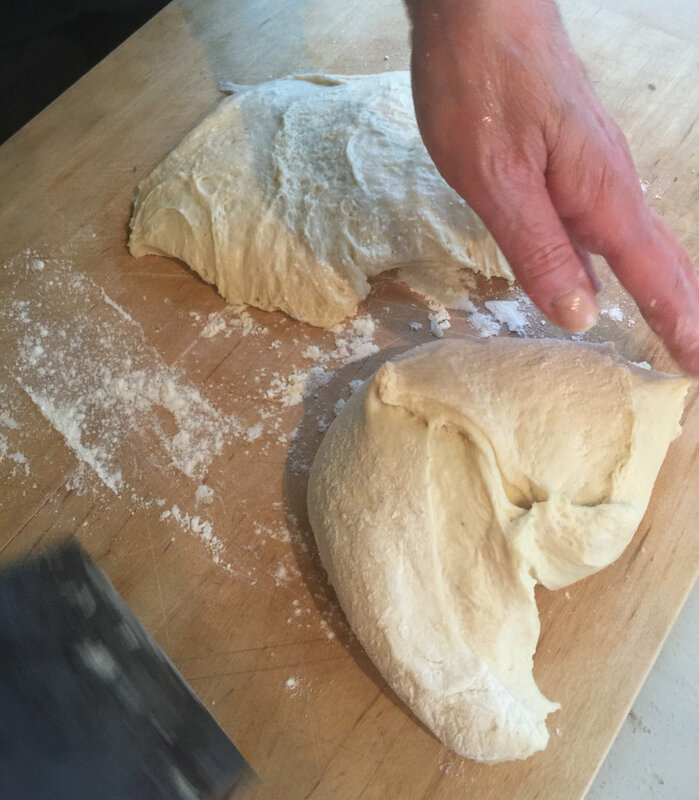 Once the dough is kneaded there are two choices: It can be set aside in a bowl to rise at room temperature if the rolls are to be baked the same day. Or, it can be transferred to a wet gallon zip-lock bag and given a refrigerated rise overnight — or even two nights — if it’s easier to mix the dough ahead. Same-day dough, will usually take less than 2 hours to rise after the rolls are shaped and put into the muffin tin. 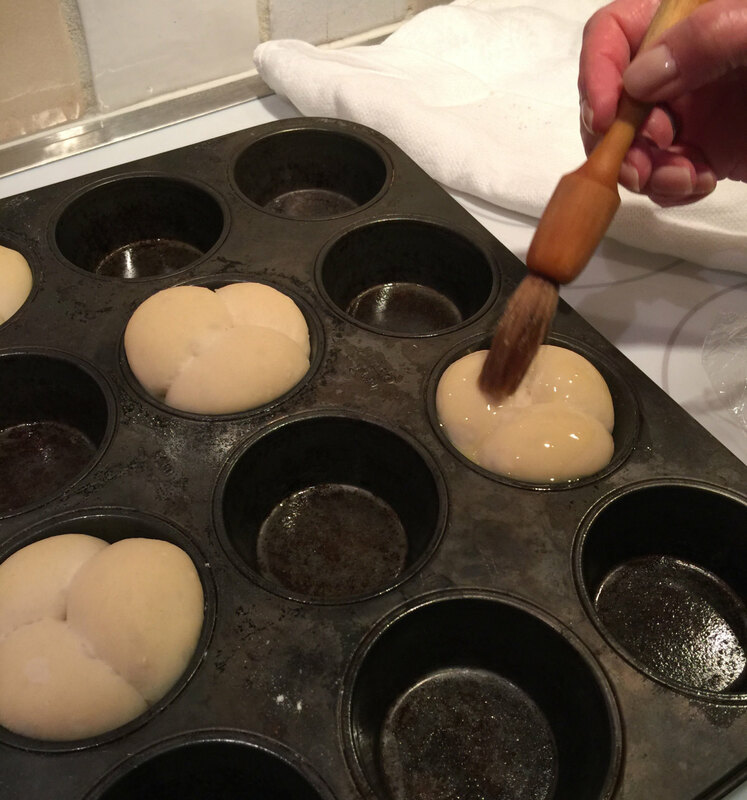 Refrigerated dough is very cold and needs to warm up before the shaped rolls can rise in the muffin tin and be ready for baking — that may take double or more than the usual time. 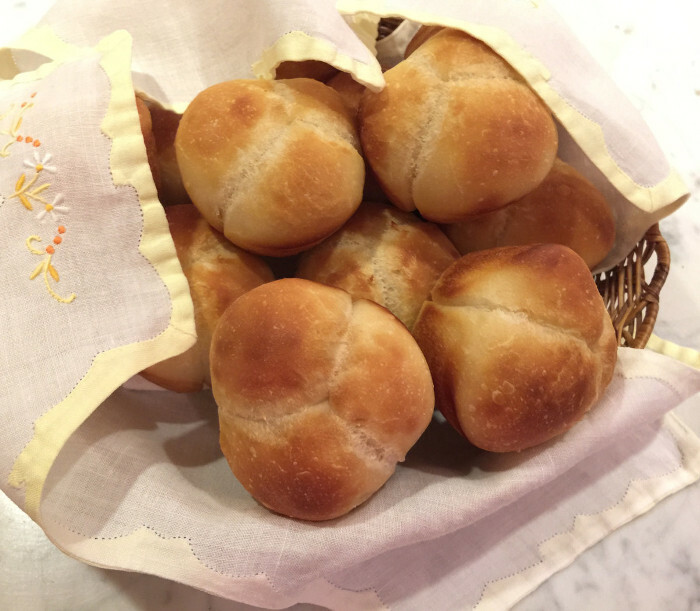 Soft rolls like these can be shaped in a variety of ways. I chose cloverleafs because they are easy and attractive. I work the risen dough as little as possible when removing it from the bowl or the refrigerator bag. I turn it out onto a floured surface and use a metal dough scraper to cut it — first in half. Then in quarters which are divided again. The result is 16 pieces. To form the cloverleafs, I cut each piece of dough into thirds and make 3 little balls. 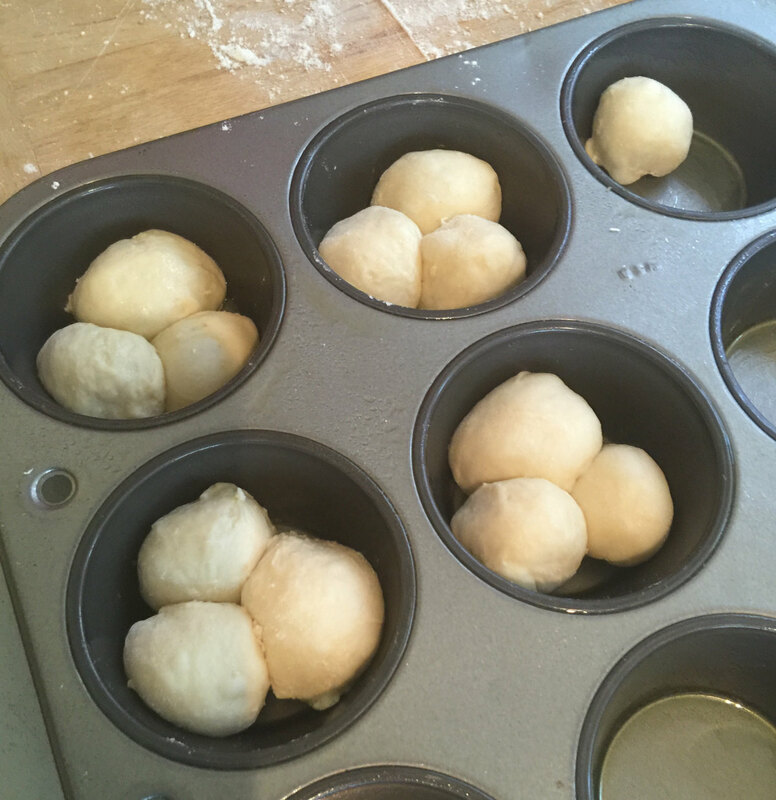 Nestle 3 dough balls into each muffin cup. So easy. The muffin cups are a guide to ensure that the rolls rise just above the rims. Then they are ready to brush gently with butter and bake. 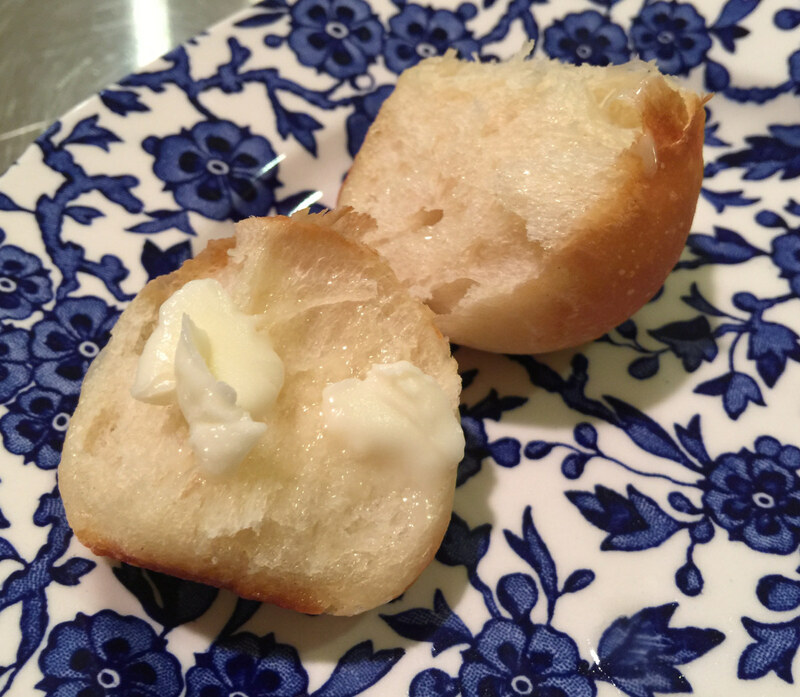 Buttermilk gives the rolls a tangy flavor and great keeping quality. They can be cooled slightly on a rack and served immediately, or set aside and reheated for 5 to 10 minutes. Do serve them warm! The gravy will thank you. Put the water and yeast in a 1 quart plastic container and mix in the flour, beating vigorously to make a thick, smooth gluey paste that is lump free. Cover tightly and set aside in a warm place (70-75F) until the mixture doubles in volume about 1-1/2 hours. Combine 3 cups flour with the sugar in a food processor work bowl fitted with the metal blade (or in a mixing bowl). Add the starter to bowl. Gently beat the egg and salt into the buttermilk and add to the bowl. Pulse into the flour until dough starts to form a ball (or stir the starter, then the buttermilk mixture, into the flour and knead by hand into a rough ball that holds together). Cover and let dough rest for 30 minutes. Continue processing for 1 minute (or continue kneading by hand) until dough is smooth, slightly sticky and taffy-like but soft throughout with no lumps or dry spots. If dough is very sticky, work in the additional 1/4 cup flour. Rinse a large mixing bowl with warm water. Put the dough in the bowl and slip the bowl into a plastic grocery bag, pull the bag tight and clip it. Or, cover the bowl tightly with plastic wrap and set aside until dough triples in volume, about 2-1/2 hours to 3 hours (if all ingredients are at room temperature) or as long as 3-1/2 hours if ingredients and room temperature are colder. (Can alternately, rinse a gallon zip-lock back with water, add the just-kneaded dough, press out all the air, zip closed and refrigerate overnight or up to two days). Lightly flour a work surface. Remove dough from bowl without kneading (or open and peel back the zip lock bag to free the dough which may have risen slightly). Place dough on the floured work surface. With a long sharp knife or a metal pastry scraper cut dough in half. (Can weigh to be sure halves are 100% equal — each half should be just under 16 ounces). Cut each half into 4 equal pieces (can weigh to be sure quarters are equal or estimate) to make 8 pieces of dough. Then cut each dough piece in half got 16 pieces total. Coat cups of 1 muffin tin with nonstick olive oil spray and wipe each with a paper towel to remove excess oil. Coat 4 alternating cups of a second muffin tin with the olive oil spray; wipe to remove excess. 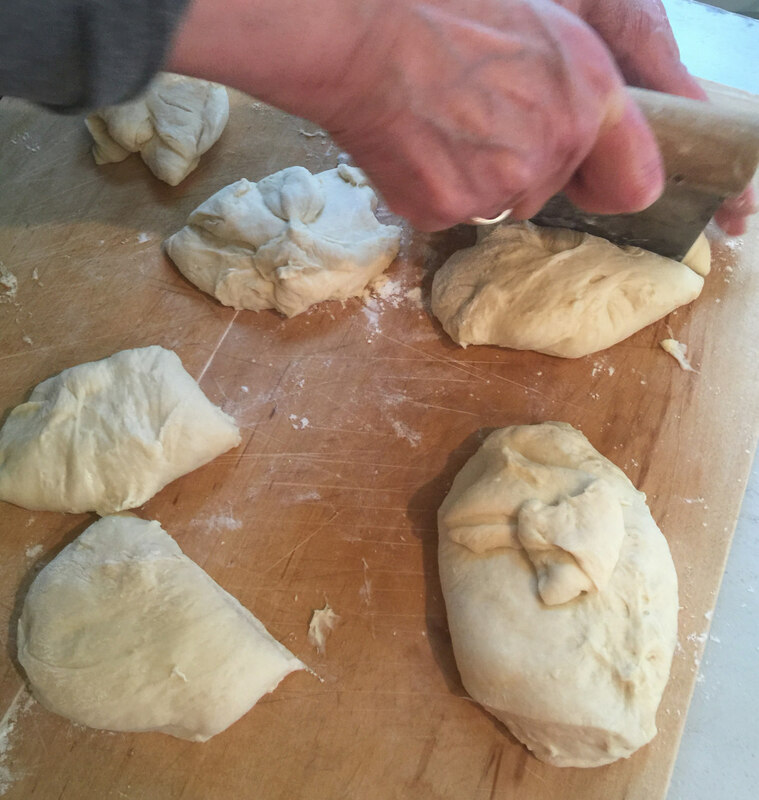 To shape the cloverleaf rolls, work on one piece of dough at a time. Divide the first piece of dough into 3 pieces. Roll each third into a 1-inch (approximate) ball, pinching to make the balls round and smooth. Place the 3 balls tightly together in one muffin cup. Repeat to shape all 16 cloverleafs. Cover the muffin tins with lightweight cloth towels and set aside in a warm draft free place until dough rises just above, or to the rim of the muffin cups or just above, usually 1 to 1-1/2 hours or as long as 2-1/2 hours depending on dough and room temperature. At least 20 minutes in advance, adjust oven rack to lowest position and heat the oven to 400 degrees. Brush the risen rolls gently with melted butter. Bake trays side by side on the same oven rack (or one at a time) until rolls are golden brown, about 15 to 20 minutes. Cool about 5 minutes in the muffin pans then remove and serve rolls warm or cool. (Can refrigerate rolls overnight). Reheat rolls and serve them warm. Muffin tins - Two standard, 12-cup muffin tins are needed for the recipe. I usually bake 12 rolls in one tin and 4 in the second. But they can be divided 8 and 8 since fuller tins tend to bake more evenly. Oven setting - I have a sophisticated convection oven with multiple settings. However, for yeast doughs I have found that a non-convection bake setting works best. The reason: heat from the bottom is required to push the dough up and get a full rise. Convection settings flowing hot air over the top of yeast doughs in the first few minutes can dry out the top and prevent a full rise that is important for the lovely texture. Avoid this dumb baking mistake - Yeast rolls are not muffins or cookies. They cannot be baked on multiple racks in the same oven. They need heat from the bottom — not from the top. Bake them side by side on a single rack set near the bottom of the oven. Flour - I use regular all purpose unbleached flour for these rolls — King Arthur (red bag) gives me great results. Yeast - Dry active yeast — I prefer Red Star — comes in little packets. The amount of yeast needed for the recipe is 1/2 teaspoon. I transfer the remaining yeast in the package to a small jar and keep that refrigerated. 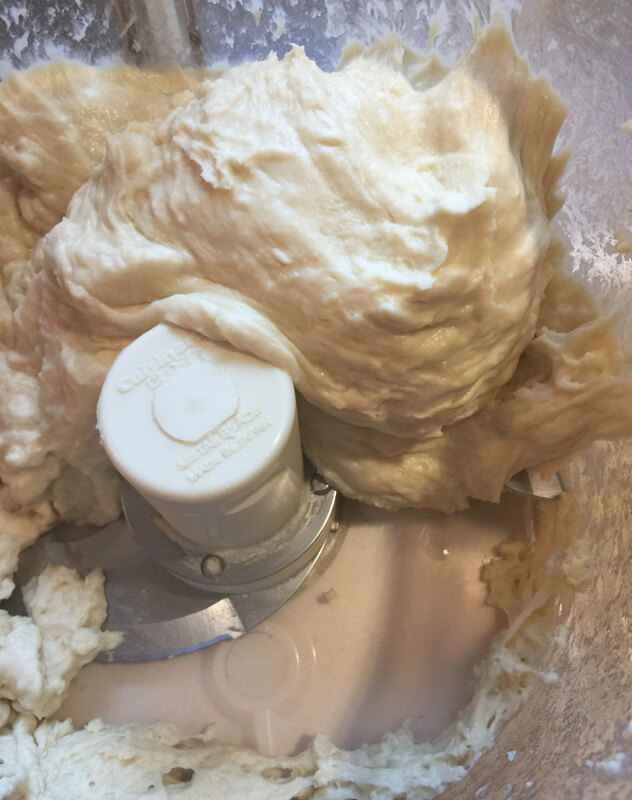 Refrigerated dough - I’m amazed at how well this dough does with a refrigerated rise — a handy option. 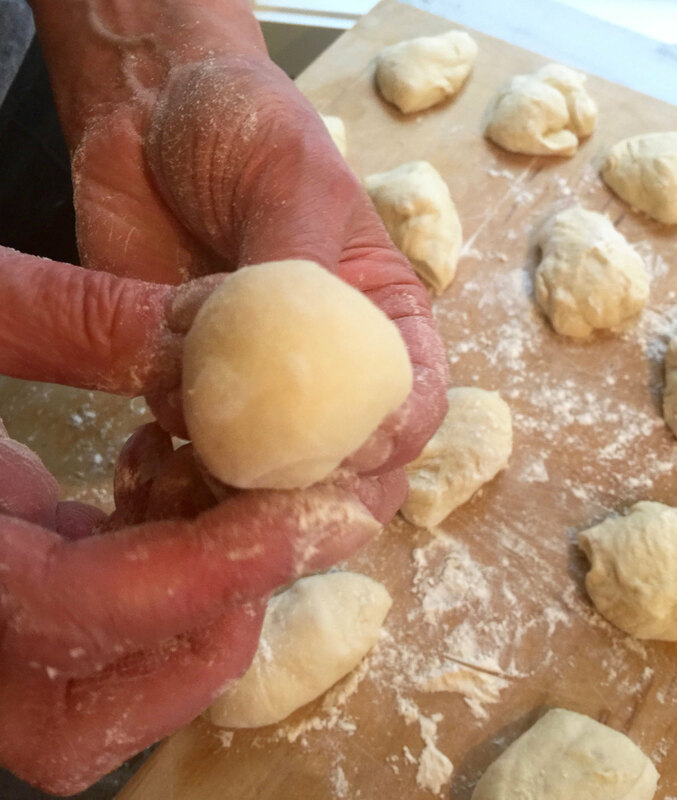 When I shape rolls from refrigerated dough, I work the balls a little longer than usual to warm them up. Refrigerated dough may take double the normal time to rise in the muffin pans. 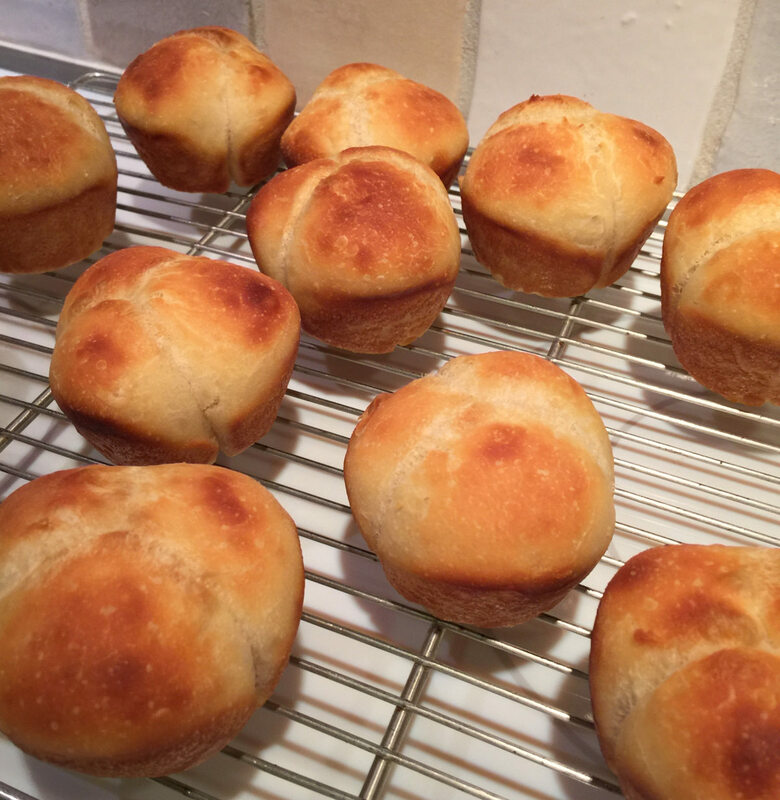 Baked rolls - While they are nicest hot from the oven, the buttermilk gives these great keeping quality. Once they are completely cool I transfer them to a plastic bag and store them in the refrigerator. Warm them up for 5 to 10 minutes in a moderate oven before serving. Different dough shapes - This dough is a chameleon. It makes 16 rolls whether they are shaped into rounds or ovals, rolled out like a cigar and knotted (knots), divided in three and braided (braids). As long as the shaped dough triples in volume before it’s baked, rolls can be made in a variety of shapes. Wow, my mouth is watering by looking at the finished product! Yum! Thanks Deb. I ate so many of these with so much butter. Yum sums it up! Jane, these look absolutely delicious! This brought back a lot of memories, as my mother used to make these for TGV and XMAS. I took up the torch when it was my turn, but now, with no one at home, I have stopped. Reading this, I have resolved to do it again at least once during this holiday season. Thanks so much!